I have been reading the book “Play to Talk: A Practical Guide to Help Your Late-Talking Child Join the Conversation” by James MacDonald Ph.D. & Pam Stoika Ph.D. I’m impressed! 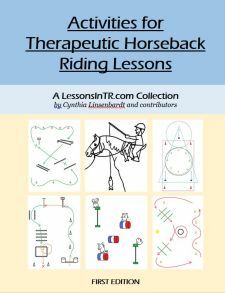 I bought it 3 years ago to help me with riders with speech disabilities and wish I’d read it sooner! I will be blogging more ideas from this book very soon. One chapter addresses the issues of asking children too many questions, and it made me realize I haven’t yet blogged about the TR adage, “Don’t ask questions!” Maybe you haven’t heard that saying, but when I first started teaching it was one of the first things I was told – as in, don’t give a command in the form of a question because the rider could say no! Makes sense, but there’s always more to it. Because the child could say no! If you say “Would you ask your horse to walk on?” and the rider says “No!” Well what then? I have had instructors in training figure this one out pretty quick, haha. Because processing questions takes longer than processing commands. There are more factors to think about. If you say “Would you ask your horse to walk on?” the rider may wonder what the other options are, wonder if he’s supposed to ask the horse verbally or physically, wonder if he’s supposed to answer the teacher verbally or do the task, etc. Vs. If you say, “Walk on!” that’s much simpler and easier to understand. The rider may not have the ability to make certain decisions and you will need to wait a long time to help them through it. 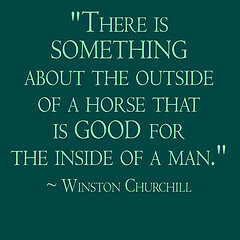 Such as the time I asked my rider if she would like to lead the horse out with the halter or by the reins… see this post for more about teaching decision making skills! When the rider has delayed processing (whether it takes longer to understand the question, or to speak their answer, or both), you need to be in a good place to wait for their answer, so everyone can feel successful. For example, in the mounting block is probably not the best time to ask them a question if they take a long time answering, because the mount tends to be the least safe part of the lesson and you want to be in and out of there ASAP! If you keep asking the same questions, it could make the rider feel you don’t think they are knowledgeable. I have had a few riders like this. I end up assuming they remember, and if they prove me wrong, THEN go back and review, because I feel it’s better for the relationship rather than assuming a lack of knowledge. As MacDonald & Stoika put it, “Adults have a deeply ingrained habit of asking children a lot of questions We habitually ask questions when we already know the answers (“What’s on your shirt?”)… We often ask questions when we’re actually giving a command (“Would you mind picking up your toys?”). … Why do we ask so many questions? Many parents believe asking questions is the best way to teach their child to talk… [or to reassure themselves] that the child knows something.” But, they go on to point out, according to research, questions do not actually help a child learn conversation skills. Rather, questions create “quiz show interactions” in which the child only learns to respond, not initiate; he is not learning the rules for appropriate natural conversations, because he is not given the chance. The authors’ research shows that when the partner asks fewer questions and just makes comments, the child stays and talks more. Instead, the authors recommend meeting the child where they are at: joining them in the things that interest them, making noises they can make, then giving them the next step. They suggest keeping questions to 20% of your verbal interactions. For example, instead of asking, “Would you turn your horse to the right?” say “Right turn!” then the rider starts singing, “To the right! To the right!” so you sing “To the right! To the right!” every time you need a right turn. To get to know your student. As a shy child, I always notice when people ask you questions about yourself to get to know you, vs. talking only about themselves or things. It makes you feel special when people ask about you. I guess my point is: don’t go around the arena saying, “Would you turn left? Would you gather up your reins? Would you put your heels down?” But rather use your questions intentionally and in a situation when you can expect your rider to answer and facilitate conversation. Those are my thoughts on that, so far. I really want to know what you think! When do you use questions or not? Are you intentional about it? This is so timely! Our instructors were just discussing this about our older riders in our Riding in the Moment program for Dementia and Alzheimer clients. Asking them questions sometimes causes them extreme anxiety because they know they should know the answer to the question, but sometimes cannot find the words to articulate an answer. We have a big sign in our arena with a question mark with a line through it as a reminder not to ask questions, but make statements instead. Thank you for this post! You’ve made me realize I use questions all the time when I talk with my nieces and nephews. Maybe I need to go on a self-realization campaign, as when I used to say “like” all the time.